NABOS is part of the Arctic Observing Network. 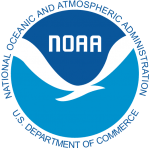 We are funded by the National Science foundation and the National Oceanic and Atmospheric Administration. Locations of moorings, cross-sections, and Lagrangian drifters. Cruises will feature repeated oceanographic sections and deployment of Lagrangian drifters and moorings (including mooring section at the Laptev Sea slope). We refer to the Amundsen and Nansen Basins collectively as the Eurasian Basin (EB), distinct from the Makarov Basin. Extensive measurements reach from Svalbard to the Lomonosov Ridge and eastward into the Makarov Basin. We do this to answer fundamental questions about circulation and transformation of Atlantic Water (AW) and to provide context for the oceanographic, biological, and chemical sampling programs. Ship-based sampling will include conductivity-temperature-depth (CTD)/rosette and geochemistry sampling and attendant sea-ice and atmospheric observations. Repeated cross-sections, some of which were initiated as early as 2002, have proved to be a powerful tool for detecting and documenting the climate change signal. Two cross-sections at 90°E and 160°E will be expanded further north to merge with the two NPEO sections (Fig. 1). This addition links our observations with another Arctic Observing Network (AON) element and provides the large-scale spatial coverage needed for data interpretation. Higher (~several km) spatial density of sampling is planned for the shelf edge vicinity and coarser sampling (~10-15km) will be used over the slope area, thus resolving fast lateral changes of water properties at the shelf margins. In the basin interior the sampling will be even coarser (~50km). CTD observations will be complemented with lowered Acoustic Doppler Current Profiler (LADCP) measurements. These will be compared to XCP velocity profiles at selected stations on the 160°E and 90°E line. Chemical tracers can be used in conjunction with temperature-salinity (T-S) measurements to address variability in halocline water formation and circulation. By combining high-resolution measurements of the NO parameter and focused bottle chemistry sampling, variability in the halocline can be studied. Fractional contributions of meteoric water, net sea-ice melt, and AW will be calculated via a simple water-type analysis incorporating conservative tracers (salinity, δ18O, and total alkalinity). The fractions of these water types will be used to assess the contribution of shelf waters to halocline layers. Combined with sensor-based, high-resolution measurements of NO, temperature, and salinity, these data will be used to gauge the role of shelf waters in halocline layer formation. 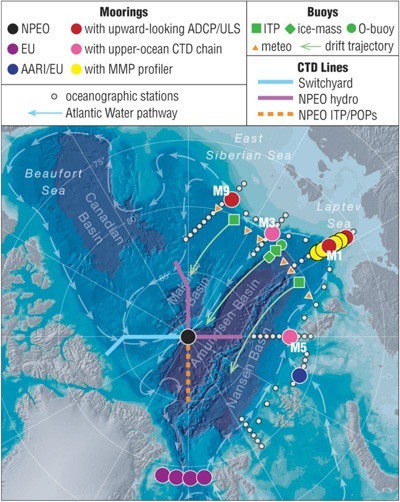 While the deployment of nitrate and dissolved oxygen sensors on moorings M1, M5, and M9 should capture the temporal variability in NO at fixed locations, particularly the seasonal cycles of biological production versus respiration and sea-ice melt and formation, the multi-disciplinary cruises will provide unparalleled detail about the distribution of both NO and freshwater sources over the Siberian shelf/slope and Eurasian Basin (EB).